Fabulously designed spacious villa offering stylish luxury living and extensive facilities on a scenic beachfront. Amenities TV/DVD in all bedrooms with iPod docks, sound systems throughout, WiFi internet, air-con bedrooms, generator, 2 kitchens, Jacuzzi, BBQ, projector screen, access to shared gym and sea kayaks. 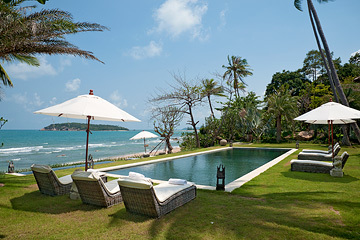 Sangsuri Villa 2 is a fabulous 7 bedroom and dorm beachfront villa located on a secluded cove in north Chaweng. Designed in contemporary tropical style, with a seamless flow between indoor and outdoor areas, the villa is spread over four levels of landscaped gardens. Thatched roofs and open-sided living areas epitomise tropical lifestyle, and embrace the sea breezes. Stunning sea views are a feature of all rooms, including the sunrise to the east, and the picture-perfect island of Koh Matlang at the northern tip of Chaweng beach. Slightly elevated from the beach, which is shared with the two neighbouring sister properties, the lower level includes the main swimming pool, huge sunken Jacuzzi tub, al-fresco dining area and deck lounge, BBQ kitchen, bedroom, and TV lounge with pull-down cinema screen. Stairs lead up to the middle level, where a second swimming pool with infinity edge is the central feature. At opposing sides of the pool are the master bedroom suite and dining room. To the rear of the pool, separated by a fountain-filled water feature, are the open-sided lounge and kitchen, behind which are two further detached bedroom suites. A wide stone stairway leads up to the top level, with two bedroom suites on separate floors of a two storey building. Set behind a high wall, the property is accessed via a gated entrance, leading to a parking forecourt and a well-equipped air-conditioned gym. The gym is fitted with Life-Fitness equipment, and is shared with the adjacent Sangsuri Villa 3. This building also contains a dorm, with 6 bunk beds and 2 pull-out beds, sleeping 2 adults or up to 8 children. Each of the 6 spacious air-conditioned bedroom suites feature sea views, 5 with luxurious King-size beds, and 1 twin bedroom, built-in wardrobes, lounge chairs or sofas, safes, ceiling fans, TV/DVD, and individually designed en-suite bathrooms. The impressive master bedroom includes a dressing room, enormous feather sofa, indoor bathroom with twin sinks and walk-in rain shower, as well as a large private balcony, and an outdoor Jacuzzi tub. Sangsuri Villa 2 is a highly specified, spacious, and beautifully designed home, ideally suited to parties of up to 12 guests. Ideally located on a scenic hidden cove between Chaweng and Choeng Mon, the established landscaped gardens create a magical ambiance. Chaweng beach’s numerous attractions, restaurants, shops, bars, and spas are a couple of minutes drive away. Fully staffed, including an English-speaking manager and Thai chef to cater for all your meals, Sangsuri Villa 2 offers a totally pampered holiday experience. -Gym with Life Fitness equipment. -Integrated sound system with iPad control centre. -All bedrooms are air-conditioned and with fans. -Pull down projector screen in the poolside lounge. -All bedrooms with TV/ DVD and iPod docks (no cable TV to bedrooms). -5 bedrooms with king-size double bed, and 1 twin.